April 10, 2010 marked the beginning of the worst oil spill in U.S. history when the Deepwater Horizon oilrig some 41 miles off the coast of Louisiana in the Gulf of Mexico blew out, exploded into a raging fire, and sent millions of barrels of oil into the Gulf over the course of 87 days. 11 of the rig’s 127-member crew were killed and many more were injured in what was a completely avoidable tragedy that was caused mostly by corporate avarice and complacency concerning the safety of the workers. The simultaneously thrilling and harrowing docudrama Deepwater Horizon stars Mark Wahlberg as Transocean chief electronics technician Mike Williams. The first act starts smoothly as Mike bids his wife Felicia (Kate Hudson) and daughter Sydney (Stella Allen) goodbye before heading out to the Deepwater Horizon oilrig, owned by BP, for what he believes will be a run-of-the-mill three-week stint before heading back home. The Transocean crew is headed by Jimmy “Mr. Jimmy” Harrell (Kurt Russell) and other members onboard include technician Andrea Fleytas (Gina Rodriguez), who’s left behind her classic muscle car that she’s trying to rebuild, and a couple of representatives from BP, including Vidrine (John Malkovich). Things start out as usual, with the normal guys being guys banter, but BP is already pressing the Transocean crew because it’s been over two months since they’ve been exploring for oil on the Deepwater Horizon and they’ve found nothing. They are starting to question if Mr. Jimmy is being too timid. Vidrine is willing to overlook the pipeline tests are showing an enormous amount of pressure in the line, and he leans on the crew to push to get back on schedule. The action kicks into overdrive in the second half of the film when the inevitable happens, what we all already know occurs. The highly pressurized methane gas explodes up the pipeline and the rig blows out. Peter Berg does an awesome job conveying the sense of danger, suspense, a courage during these life threatening and for some, very life-ending moments. We see flames shooting way up into the sky rivets and bolts rocketing like bullets and water shooting off like geysers. The combination of visual effects and sound design (the film ran in theaters with DTS:X and Atmos mixes where available) puts you right in the middle of the harrowing ordeal. Not only that, but the set was built to 85% scale at an old Six Flags amusement park and combined with these practical effects and CGI imparts a sense of realism that has you permanently teetering on the edge of your seat. By the time we get to a scene where Mike and Andrea must summon up the courage to jump from the exploding, fiery oilrig into the debris-laden fiery ocean, we’re completely invested in their fates. The ending of the film is its weakest point when after the high stakes drama, the air is let out of the balloon and it turns into a sentimental remembrance of those lost and the courage of those who survived. There is some brief text explaining the disaster as well but no real explaining of the environmental or economic and health costs of its aftermath, which we are still dealing with today. Still, the film will leave you spellbound and glued to the screen and inspired by the human will to survive. Deepwater Horizon was mainly shot at 3.4K on the Arri Alexa XT with Leica Summicron-C and Summilux-C lenses, but one scene was shot on the Arri Alexa 65 with Hasselblad Prime 65 lenses at 6.5K. A 2K DI (Digital Intermediate) was utilized, so this 4K Utra HD Blu-ray Disc is taken from a 2K master and upscaled to 4K resolution. The real difference in the picture quality here is the fantastically applied HDR (High Dynamic Range). The pure digital image does indeed look superb don’t get me wrong. There’s a natural, organic cinematic quality, lots of texture and strong color reproduction, even of there is a purposely-muted palette used for dramatic effect. That said, the nuanced shadows, the natural appearance of the flesh tones, and the bright, flames of the methane-fueled fires is amazing. 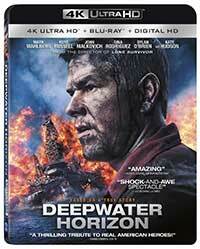 The film appears on the UHD in 2.40:1 2160p HEVC encodement from Summit Entertainment. This disc gets a purely reference quality Dolby Atmos track that slams you right into the action after the midway point of the film. The first half of the film is mixed more subtly, but is still beautifully balanced with atmosphere and little sounds that draw you into the film. The Atmos channels variably carry helicopters flying overhead or help convey the sound of voices coming over the PA system on the oilrig. When the explosions start in the second half, sounds come from all around, and the low end is staggering. There’s even one point when the BIG fire first takes hold that some artistic license is used and the low-end is scaled back to almost zero, in anticipation of what’s to come. Summit offers an abundance of making of extras with this release, most self-explanatory, and unlike the majority of 4K releases I have seen so far, all the video extras are included on both the 4K and standard BD. There is also a VR app available for download with additional VR commentary. VR App available on iOS and Android with virtual reality commentary and more. Captain of the Rig: Peter Berg (1.78:1; 1080p/24; 00:18:15) – Director and actor Peter Berg speaks about directing Deepwater Horizon. 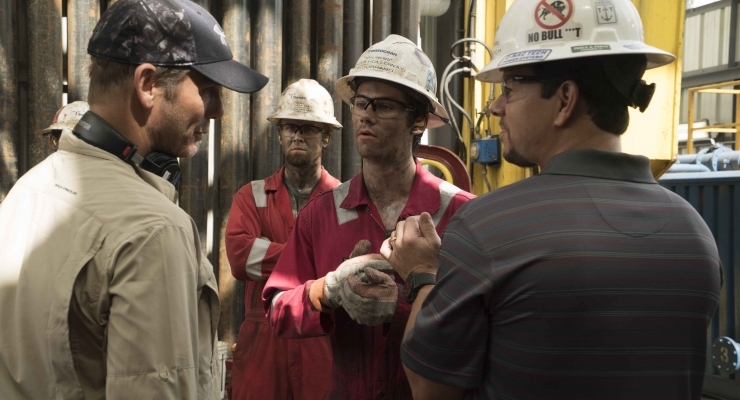 Peter Berg has an all around winner with the stunning and uplifting docudrama Deepwater Horizon. It is visually and emotionally top-notch and the audio track is one of the best going as well. This one should be on everyone’s to buy list. A riveting testament to courage and the human spirit that is both visually and aurally stunning in this 4K Ultra HD Blu-ray release from Summit.